At Flatliners Pest Control, we can help you get rid of scorpions in your Las Vegas home. These creepy-looking critters often show up in our bathrooms, our desert landscaping, and occasionally even our beds. The last thing we want to do is mess with them. We invite you to leave the pinchers and venom to your Vegas scorpion control experts. We’re here to help. Since scorpions hide to avoid our scorching desert heat during the day, you may never know they are there. The problem arises when they find comfort in cool, dark spots, like your shoe or your sheets. Their flat bodies make it easy for them to squeeze into your nice, cool home where they find new places to hide, feed, and breed. That’s where we come in, your trusted scorpion exterminator. 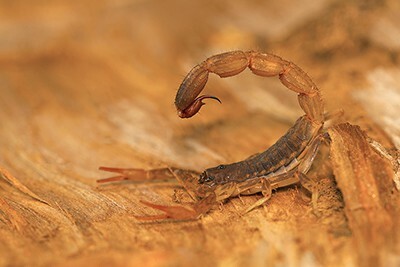 While most scorpions native to Las Vegas are larger (some are even large enough to feed on lizards and mice) their venomous stings are usually not deadly unless you have an allergy. Unfortunately, the smaller, far more common and dangerous species, like the Bark Scorpion, can be dangerous to pets and small children. Scorpion removal is essential for their safety. If you’re looking for the best scorpion exterminator in Las Vegas, contact us at Flatliners Pest Control. Even if a scorpion sting is not deadly to you, man does it hurt. Since these pests feed most commonly on insects like crickets, roaches, and even other scorpions, you may have more than a scorpion problem. The good news is, we’ve got all of your pest control problems covered. Call us today to schedule your next service appointment.